A live video by Simple Minds was long overdue. A video was planned to accompany Live In The City Of Light, and the Paris gigs were filmed, but this plan was abandoned in the end. Therefore Verona was conceived as this "missing" video. 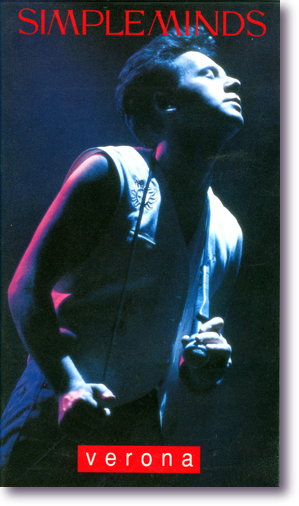 It was shot on the 15th September 1989 at the L'Arena, Verona, Italy during the Street Fighting Years tour. With the first unit concentrating on the gig itself, a second unit filmed scenes around the streets, the railway station and in the countryside. Therefore the final edit featured the concert footage intersperced with scenes shot around the city. Some soundbites from interview footage with Jim, Charlie, Mick, Mel and Bruce Findlay were also mixed in to the longer tracks. Charlie, Mick and Lisa Germano were also filmed busking outside the venue. This segment formed part of the Gaelic Melody instrumental which formed an interlude between the two halves of the concert. The title of the video wasn't confirmed until the last minute. Most promo adverts don't mention Verona , instead titling the video Live And On The Streets . Whilst the majority of the songs appear live, most were edited whilst others had interview dialogue added. In other cases studio instrumentals were used. The footage was also mixed with some images from the band's previous promo videos (most noticably during This Is Your Land, Soul Crying Out and Belfast Child). The promo video for Let It All Come Down was simply an edit from this video. As Verona was seen as plugging a gap in the discography, no accompanying soundtrack album was released. Three unedited tracks appeared on the limited edition Verona EP, and several other unedited versions appeared as Real Life B-sides. However, the bulk of the material remains unissued. In 2003, it was remixed in 5:1 surround sound and released as part of the Seen The Lights - A Visual History double DVD set. It was subsequently reissued as Seen The Lights - Live In Verona the following year. No extra footage was released. Jim Kerr, Charlie Burchill, Mick MacNeil, Mel Gaynor with Malcolm Foster (bass), Lisa Germano (violin), Andy Duncan (percussion) and Anne McCaig (backing vocals). VHS video in clear plastic case with double-sided colour sleeve. Copies are still plentiful and turn up regularly.